The pre-washed fabric prevents shrinkage and is super soft to the touch. The quilted geometric pattern on both sides of the quilt presents a modern look that goes well with all bedroom decors. With four different color ways to choose from, you can go with the classic white or grey, or the bold orange or green. Set includes 1 quilt and 2 shams (Only 1 sham for Twin size). Care instructions are machine wash cold with like colors, tumble dry low. This is exactly the quality that I would expect for 100% cotton. Color is dark green leaning towards sage green hue. Bought as a gift, hopefully the color is right. I love this quilt so much! It has a very relaxed and natural look. The package said “vintage” but it doesn’t look old or anything - just kind of cool and casual. But more importantly because it is cotton and not poly, I sleep all night without having to keep kicking the covers off. Life-changing! Bought the grey-- looks sharp, feels comfortable, and cost about a third of what other retailers demanding. Perfect weight, true to color online, everything about it makes me happy. It’s not top quality but it’s fine. I have dogs so the housekeeper washing the bedding weekly. This has held up perfectly fine so far. It’s 100% cotton which was a must for me. I hate synthetics. "Is the fill also 100% cotton?" Yes, this fill for this quilt is also 100-percent cotton. However, this quilt is lightly filled, so there is not much filling it it. There are two layers of cotton fabric, making it still very thick and comfortable. 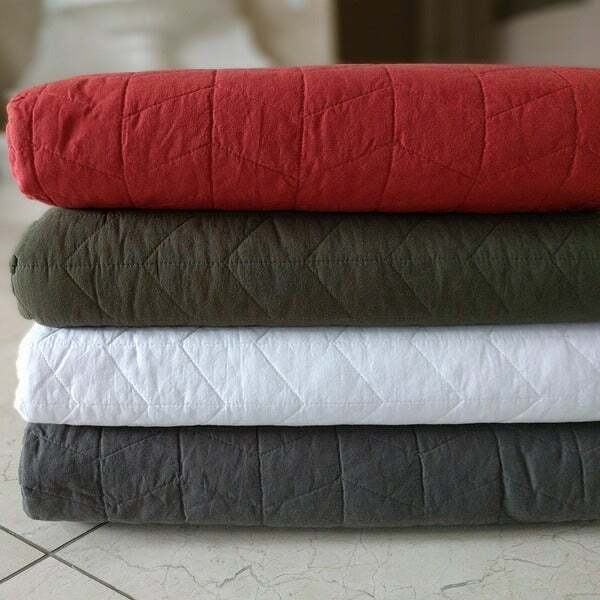 I like the color and wanted a quilt for a guest bedroom that is flexible and a neutral color.